Ever see a cheapo cheese mieneke muffler on a classic vintage Ferrari? Nope ! we didn’t think so either. Above, Jonathan Chertok, Austin TEXAS (2016) Sweet! 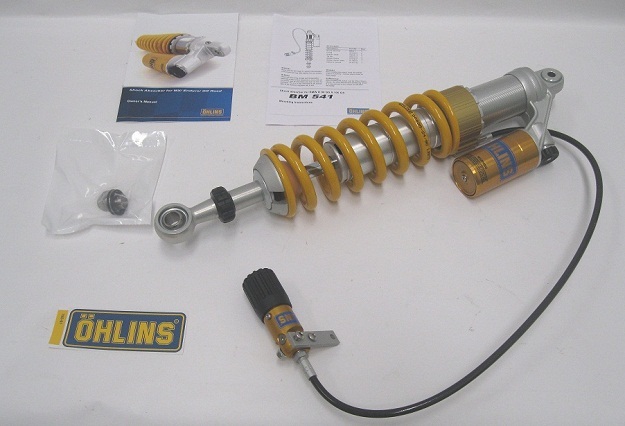 That’s why Ohlins shocks are something special and the most popular authentic traditional meant to be brand that out performs any other brand with three popular price points and option built shocks. 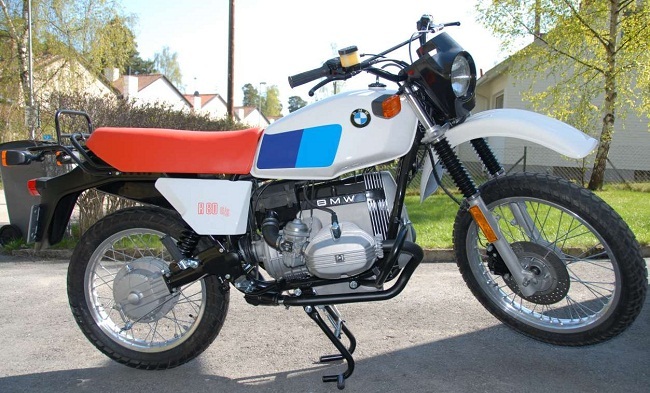 They have 3 popular flavors with different features, for the original long lasting bikes that started the Adventure and Paris to Dakar movement! 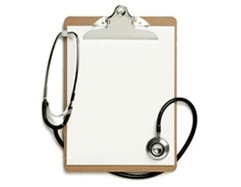 These can be easily serviced and rebuilt but are made to last a very long time and are a huge improvement over stock. 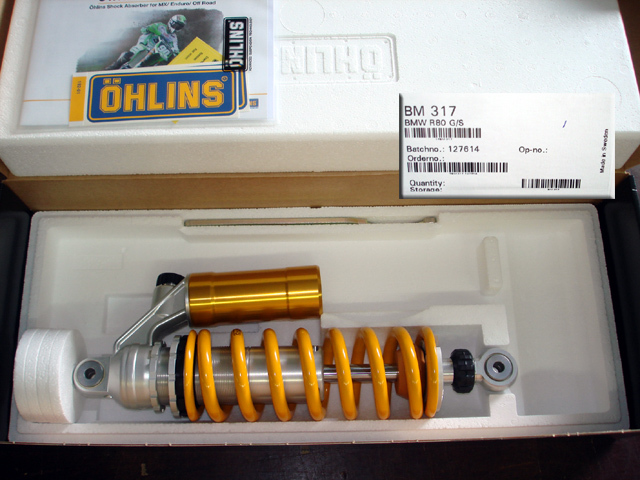 Above is the Simple Ohlins BM051, kinda nice! 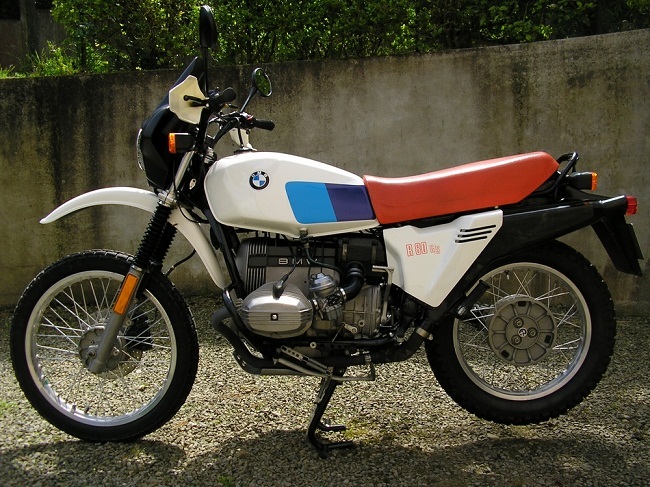 S46DR1 Series. A very heavy duty 46mm body and 16mm shaft with divided fluid and nitrogen with an internal floating piston within the main shock body a couple inches from the top end. This makes for very long lasting fade free performance and additional weight tuning feature by adding or removing various nitrogen pressures and piston placement for volume. It also has about 45 click damping adjust (that’s the black clicker under the spring). 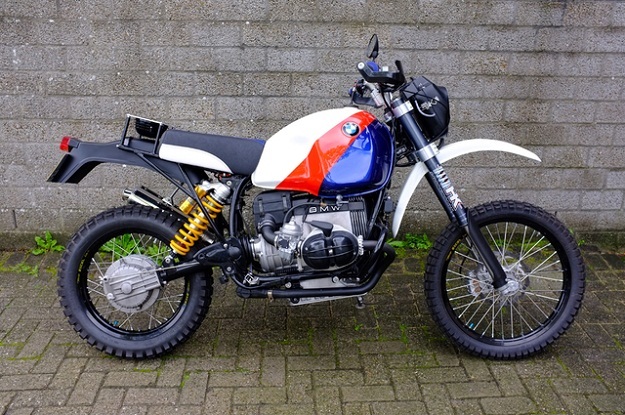 Also all Ohlins shocks are rebuidable unlike many others they should out live the bikes! Adjustable Compression, Rebound, Hydraulic Remote Preloader, heavy duty 46mm large body and 16mm shaft. So this one adds all the bells and whistles! Above shown is the Ohlins old series S46, The replacement now has adjustable Compression with the addition of a hydraulic remote spring preloader (See blow more info…). All of these Ohlins shocks have divided fluid and nitrogen so none are the “emulsion” type that mix fluid and nitrogen like some other brands. Ohlins has a very fade free design on all types offered for these. 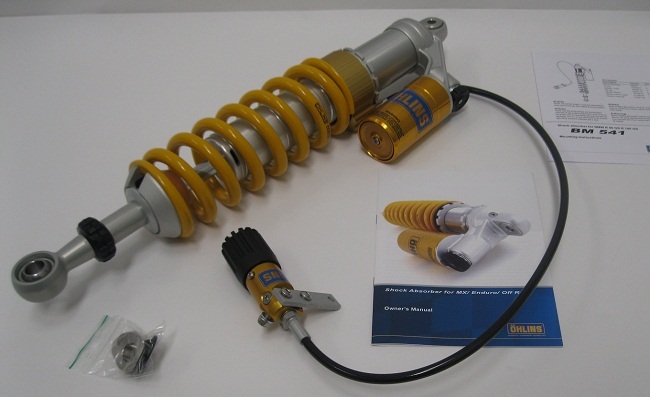 They all have very heavy duty 46mm large bodies and 16 mm shafts using Ohlins high quality 57mm ID springs. 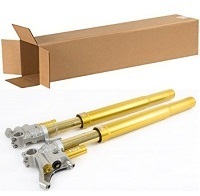 Ohlins Bm541, Type S46PR1C1S, has piggyback design with adjustable Compression, Rebound, Hydraulic Spring preloader, 498.5 mm eye-to eye-length, excellent shock with more Offroad adjustability or loading variations, it does have larger fluid volume and nitrogen area. Ohlins Bm836, Type S46DR1S , has divided internal floating piston in main body instead of in gold reservoir, has adjustable Rebound and Hydraulic Spring Preloader, 495 mm eye-to-eye length. Ohlins Bm051, Type S46DR1 , has divided internal floating piston for fluid separate from nitrogen for fade free performance, has adjustable Rebound , Spanner style spring adjustment, 495 mm eye-to-eye length. 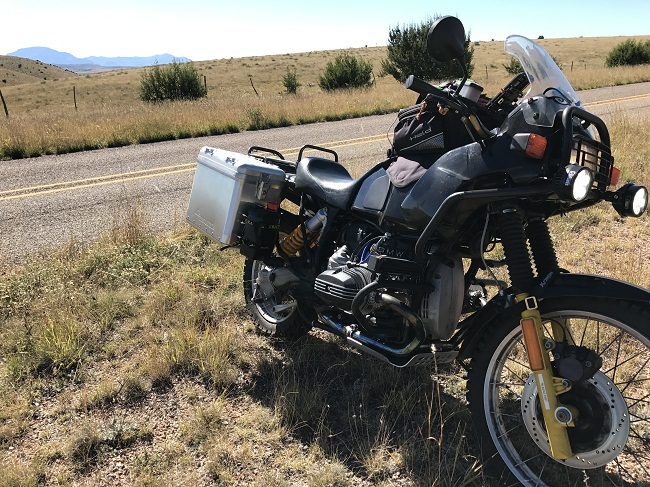 The Stock forks tend to be way too soft for most and especially when mixed offroad adventuring on gravel roads with washboards and single trails. The standard fork spring rate is claimed to only be when bike was new at about .47 kg/mm kinda soft forks with a damper rod and small tube design. The stock 40mm Marzocchi forks have a standard fluid level of about 150mm, most raise this by at least 10-15mm to start, so maybe try 135mm-140mm. 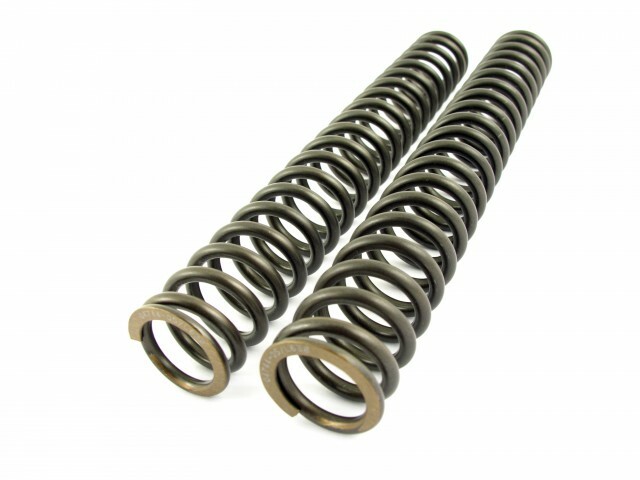 We sell lots of springs heavier progressive springs that are .63kg-.89kg , 33mm O.D. x 575mm long and (most raise the fluid level about 10mm -15mm to start). Most find 10mm-14mm preload on the fork spring and 12wt -15wt fluid a pretty good. There are straight rate fork springs .80/.90/.95 also available. These are Cartridge Emulators (shown above) they have an adapter needed with kit sold together. Some Damper rod enlargement of compression holes is required as shown in their instructions. They do come with instructions, often times a new fork spring to standard fork spring is required with these because the part needs the correct spacing and fit. They sit on top on inner damper rod so they take up about 12mm space, so to maintain same preload you would take some off the fork spring spacer common to aftermarket springs. 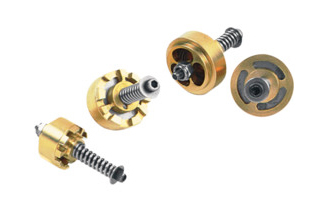 They are some what adjustable by removal and turning allen key on the small pressure spring shown or optional strength pressure springs that are available. They are a little tricky to get right so be prepared for occasional fine tuning! Reminder this year shock is shorter 361mm eye-to eye for this year and model. 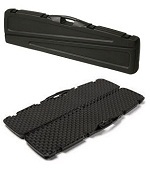 BM 317 Piggyback, Adjustable Rebound, Adjustable Compression, 361mm eye-to-eye length. Has adjustable Compression, Rebound, Spring preload with spanners. Easy to loosen spanner locker and just turn spring as needed while bike is unweighted, then relock spring spanner as shown in owners manual. The forks are skinny 36mm, types with possible claimed std .33 kg softy springs. 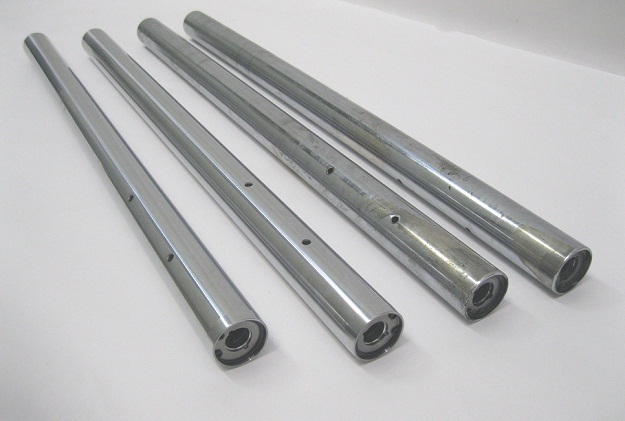 Many older forks can have tubes that need replacing for various condition issues. A possible aftermarket Emulsion Cartridge Emulaters and Adaptors can be a fork option with new seals, springs, preload tubes, etc. Some people just swap the shock and forks springs with seals so they don’t make a “Frankenstien Mess” out of it. 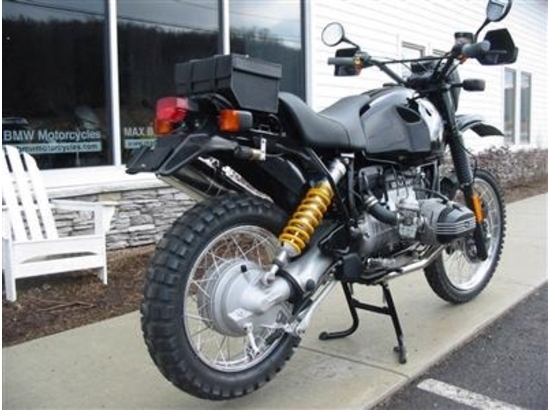 You can ride with a better shock and keep the crusty stock on in the goodie pile till you sell the bike. 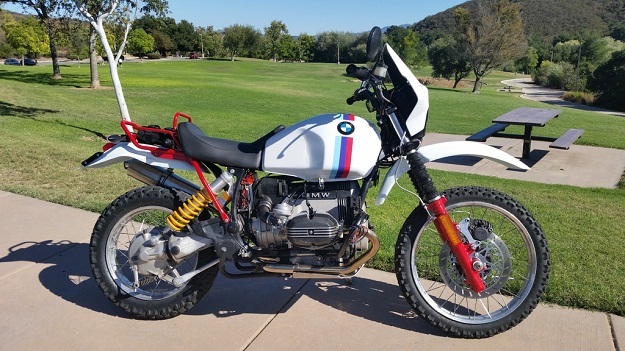 Same thing we agree to fork mods, maybe a “non-machining” simple works best and live with it unless you have a spare set of forks. This is the longer BM051 that is (495mm/80mm eye to eye vs the 361mm /89mm). It is a divided fluid and nitrogen S46DR1 shock that’s heavy duty with a 16mm shaft and 57mm Id Spring. Don’t tell us but we’ve heard people using it on the older model, you could make it exact or any length in between by switching the shock body and spacers for those that like to do things correctly! The STANDARD BMW R 80 GS forks when doing a Factory Refresh you should replace all the little seals, bushings, wear parts so you have good results, even the inner and outer tubes can were on those. The Skinny forks should be straight and true and not like a banana.